From the inception of AIS, Sine Qua Non has supplied industry leading technology to the market. All our legacy products date back to 1992 in development. Our second generation products are now comming to fruition. AISTE.ST formerly Sine Qua Non would like to take this opportunity to thank you for your continued ineterst in one of the AIS Developer Studio suite of products. We want to assure you that this product range is designed using over 22 Years of AIS experience and thoroughly tested to ensure your complete satisfaction. Where did it all begin. Between 1992 and 1995 George Fyfe was contracted as a development partner to design and produce a RF transceiver technology, which Portnet Marine Data Systems would use as an identification and telemetry RF backbone for the full length of the South African coastline. The hardware was known as the H25. In those early days the GPS 1PPS at times just vanished, so a secondary mechanism of TDMA lock was needed and the “Semaphore” method was developed. This was based on how many H25 stations were received at a specific location. This allowed a plurality of transmitting objects to share a TDMA structure in the cell they found themselves due to the “FM capture effect”. i.e. dBm, distance and time. At the end of 1995, Portnet hosted the IALA Aids to Navigation conference in Cape Town. It was immediately recognised that parallel marine identification technologies had been developing across the seas. This Cape Town meeting was the pre-cursor to the inaugural IALA AIS meeting held early 1996 in Sweden. Marine Data System represented the interests of George Fyfe at the early IALA AIS working group meetings. At discussions following these meetings it soon became clear that patents were frowned upon. As George Fyfe the original developer of the “TDMA Semaphore Concept” was at that time a co-patentee with Marine Data Systems , he sold his share of the development to Marine Data Systems. George Fyfe was rewarded with a five-year restraint of trade in AIS transponder technology. The semaphore technology went on to be included in ITU-M.1371. With the restraint on AIS transponder technology in place, George Fyfe set his sights on developing production and front line AIS test sets. This resulted in the PMG1 and the AITS-R. These units were designed and produced at a time when there was no final AIS documentation available. All documents were working group draft documents. Sine Qua Non went on to produce these industry leading hardware items for many years. And so the story continues with AIS TEST. The AIS Developer Studio is a synergistic merger of software and hardware modules to create a general AIS development, production, integration and verification environment. It provides a value added service to all users of AIS equipment. The main objective of the system is to assist in providing different test and monitoring scenarios using the PC workstation as the main control object. It does this by providing interactive modules, which have been streamlined to produce verifiable outcomes. The Automatic Identification System (AIS Class A) is defined by the IMO and has been made a carriage requirement by the latest revision of SOLAS Chapter V. This does not only require the AIS to be installed, but also to provide information used for ship navigation. The AIS has been standardised by the ITU and IEC and is subject to type approval. In order to fulfil the reliability requirements of information exchange, product pre - verification and final verification must be done at all levels of development to ensure correct AIS inter operability. It is the intention of AISTE.ST through the current and further development of the AIS Developer Studio suite of components to continue to supply a cost effective method for development, production, integration and verification of protocols as used by AIS, ASM and VDE. It is the intention of AISTE.ST to supply upgrades to the AIS Developer suite user group as and when they become available. Users may subscribe to this upgrade service. The AIS Developer Studio makes use of NTP/SNTP network lock to obtain a relative UTC time base. All events are time stamped with the NTP/SNTP network lock. The accuracy of the UTC time stamp is dependent on your network lock of choice. Pseudo Electronic Position Fixing Device providing exclusive direct control over GPS, COG, SOG, HDT, ROT for each individual target. Dynamic navigation derived from PEPFD settings. Detection of non valid 6 bit TEXT characters. 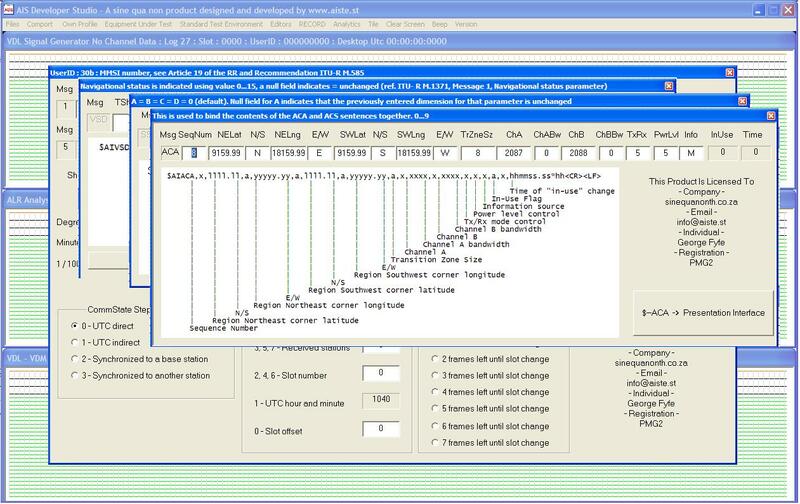 Global setting of fault indication – (PC beep). Tracking, static and voyage data. Descriptions for each edit window are auto provided. Auto profile 5 targets using licence defaults or individual. From 1 July 2014 legacy units may be returned to the "AIS Test" workshop for repair and re-verification according to original factory specifications..
How To Return A Unit To AIS Test Workshop. 1.Please contact us by email to obtain return procedure for repair and or re-verification . 2.For warranty service, enclose a scanned copy of your sales receipt with your email. If a copy of the original purchase receipt is not available, your product may be deemed out-of-warranty. .
3.If you are uncertain what product you own and or require a quote please contact us by email. All internal simulation process's for packet creation can be viewed graphically. The Modulation Waveform Generator module that is embedded in the simulator creates all the required modulation waveforms as set out in IEC61993-2 paragraph 10.4 and IEC 62287 paragraph 10.4. It can perform the encoder requirement as set out in IEC61993-2 10.6. All original PMG1 legacy waveforms are supported. Further to this all M 1371-5 messages and waveforms are supported. It creates and generates 5 mutually exclusive AIS Targets. Standard Test Environment baseband waveforms can be output via the PC Sound Card Line Out to an external RF Signal Generator coupled to the EUT via a power pad. The Pseudo Electronic Position Fixing Device Dialogue provides an input method for formatting the NMEA defined GPS and SENSOR sentences. During parts of the verification the EUT GPS antenna is disconnected. The Pseudo Electronic Position Fixing Device is ported to the EUT sensor RS422 input. Dynamic external control of all positional and sensor information can be implemented using this method. The Own Profile Dialogue provides an input method for formatting any packets generated using RATDMA as a mutually exclusive AIS Object. It can be set-up for SOTDMA or ITDMA communication states. Absolute control of generated base band or IQ VDL packet modulation data is available through this module. The OWN PROFILE allows right mouse click injection of any M 1371-5 packet into the Standard Test Environment. This allows realtime polling, channel managment etc or information excahnge to the Equipment Under Test via the externally modulated RF VDL signal. The EUT MMSI is used to identify and isolate all VDM / VDO messages generated in the Standard Test Environment by the equipment under test. This allows realtime analysis of all VDO / VDM traffic. The Standard Test Environment set-up provides an input method for formatting any packets generated automatically as mutually exclusive AIS Objects within the same VDL environment as the EUT. All 5 targets enter the VDL using ITDMA communication state formatting. After entry they will enter their respective EPFD dynamic navigation set-ups using SOTDMA communication state formatting. By respectively changing sensor data the dynamic navigation state of the target can be altered in real time. Absolute control of generated base band or IQ VDL packet data is available through this module. The AIS Developer Studio uses 3 timelines to display the following UTC time logged data. Signal Generator VDO / EUT VDO / EUT VDM or external receiver VDM information. The AIS Developer Studio will decode all required M 1371-5 messages. By placing the mouse cursor over the log indication and left clicking the mouse button, the relative message filter will show the decoded information that lies below the mouse cursor. The OWN Profile, EUT VDO, EUT VDM ( or external receiver VDM ) time lines can be recorded and analised graphically. AISTE.ST continues to supply support and OEM re-vereification of all Sine Qua Non legacy products. If you are interested in the AIS Deveoper Studio range of products or wish to be kept in the loop or wish to order a product, please send an email to the address below.